The EMT3 Optimized All Risk®; Wristband Triage Tag is specifically engineered as an integral part of the new EMT3 (Enhanced Method of Triage, Treatment and Transportation) System. 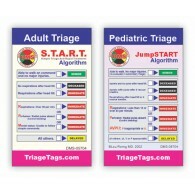 It features updates such as a larger, more detailed Transportation Receipt, an added Ambulance receipt, and a ..
All Risk® Dual Wristband Pediatric Triage Tag This is our Synthetic Paper All Risk(R) Pediatric Triage Tag with the added benefit of 2 bar-coded wristbands; one for the patient, and one for the parent or guardian. This NEW All Risk® Dual Wristba..
DMS-05006 All Risk® Triage Tag Standard • Florida • Military Now Optimized for EMT3™ New larger more detailed Transportation Receipt, Ambulance Receipt, and downward triage capability. First responders are facing challenges never before imagined. The once unthinkable threat of radiol..
1 - 300' Blue Ribbon Roll made specifically to fit our DMS-05763 and DMS-05895 Dispenser Bags ..